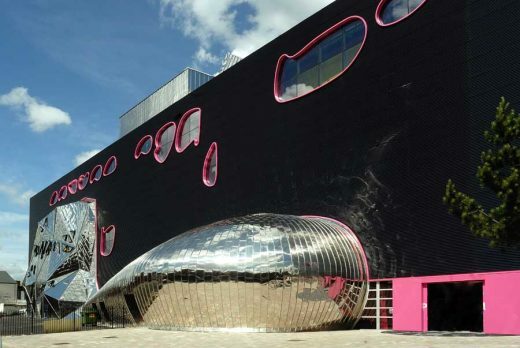 The Public is an iconic building central to the regeneration of West Bromwich. It is an unusual arts venue as it provides office space alongside exhibition areas, arts facilities and cafes. 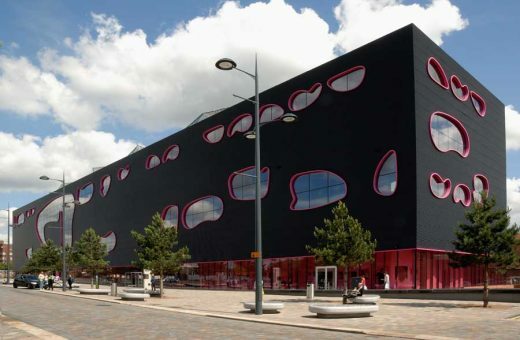 Designed by Will Alsop the building is in many respects an artwork in its own right. The lighting is designed to be an integral part of the experience of the building. Both colour and dynamics are employed to create a remarkable series of events within the multiform interior: essentially there are as many ways of experiencing the building as there are reasons to visit it. Conceptually the lighting interacts with the visitor. From the pools of light at the entrances highlighting the visitors’ arrival, different lighting experiences pervade the ground floor. In the Cafe Bar there is a large area of illuminated floor and in the central area abstracted leaf patterns accent the large exhibition trees. Moving towards the theatre the visitor walks under a canopy of flowing neon arriving at the strong wall-washed lift lobby where the lift doors are further outlined inviting you upwards through the building. The exhibition space is one of the first specifically created to house interactive art, therefore lighting has to permit many different screen based activities. Working closely with exhibition designer Ben Kelly we incorporated the lighting into the exhibition structure using LEDs, Electroluminescent panels and gobo projectors. 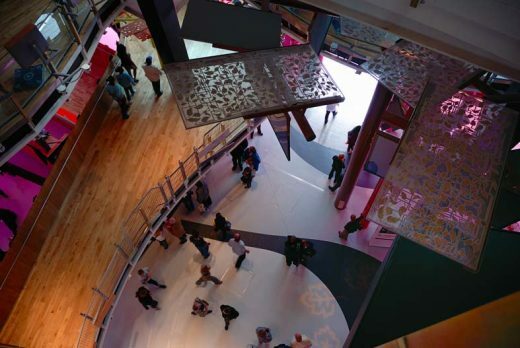 Together we created a fascinating dynamic forest where integrated exhibits can be enjoyed. There are also two large gallery spaces used for temporary exhibitions, these are provided with highly flexible lighting equipment that is easily tailored to specific installations. The gallery experience also includes a convoluted ramp linking the galleries described but creating exhibition space along its entire length. 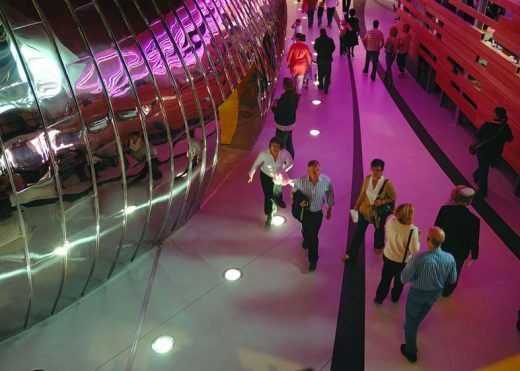 Lighting this element of the building to express the form and its’ activities is accomplished by simple dimmable fluorescent fittings that are programmed with a gentle sequence describing the flow of people along the ramp. The Public announces itself in the nightscape through the outlining of the “jelly bean” shaped windows and the visibility of activities within. 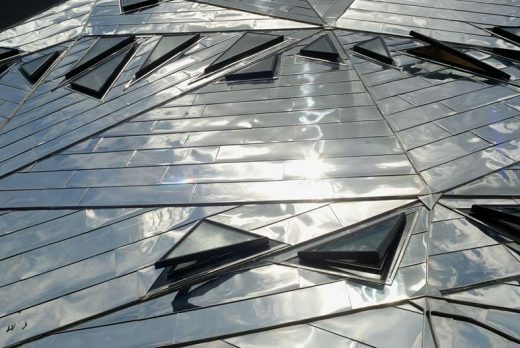 The building is crowned with reflective forms containing plant, stairwells and other purely functional spaces, these reflect essential safety lighting on the roof to create a jewel-like sparkle. Achieving this project has not been easy. Construction budget problems resulting in a change of ownership, architect and focus half way through the build required very careful consideration of the most cost effective ways of attaining the design goals and involved working closely with the manufacturers of the necessary special products required. The eventual success of this project is due to the support and determination of a few key people including Project Manager Alex Mclennan, Architect Julian Flannery and Exhibition Designer Ben Kelly who all provided support for KSLD’s creative lighting scheme.